Happy New Year, everyone! Thank you for reading, commenting, cooking, (and eating!) with me in 2009. I look forward to sharing many more stories and many more of my (er, sometimes my mom's) recipes with you this year. I will also be introducing something totally new. Well, new for me anyway. I can't wait to show you soon. I am also pleased to announce that two of my pieces, Bacon Gets Its Just Desserts and Grilled Cheese Gets An Update were the #1 and #2 most read pieces on NPR's Kitchen Window in 2009. 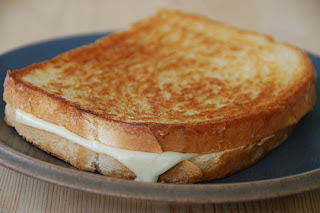 This is a no-frills grilled cheese sandwich – the one that children love and that makes an adult feel like a kid again. Butter one side of each slice of bread. Place slices, buttered side down, on a clean work surface. Place both slices of cheese on one slice of bread, slightly overlapping them. Top with the second slice of bread, buttered side up. Close the sandwich. Place sandwich in a preheated nonstick skillet over medium heat. Cook 2 minutes, or until the underside is golden brown and the cheese has begun to melt. Flip the sandwich with a spatula, pressing lightly to flatten. Cook 1 minute, or until it is golden brown and the cheese is completely melted. Slice in half on the diagonal. Eat it while it's hot. Here's to a delicious 2010! Happy New year Susan. And I am sure looking forward to your delicous 2010. Happy New Year, Susan! Congrats on the successes of 2009 and best wishes for more in 2010! 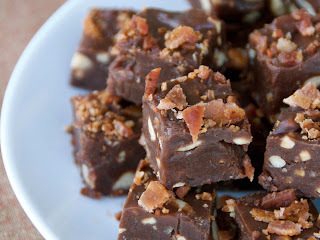 Loved the Chocolate Bacon Peanut Bark. Easy to make and delicious. Congrats, Susan! I saw the list on NPR and was tickled that you got the top 2 slots. That's our blogger! Warmest wishes for the new year! Happy New Year dear Susan!! Looking forward to many more yummies during this year. I do look forward to the new year and reading your blog! The fudge looks so creamy and rich! Happy New Year to you. Looking forward to all of your fabulous posts and recipes. That's so cool that you are #1 and #2! Your blog is always a place of delicious excellence and I look forward to another year of food together. Happy New Year! Happy New Year Susan, and congrats on getting the top two spots! Congrats! Grilled cheese is a staple in our house, and it's always served alongside tomato soup. vanillastrawberry-"Buttery goodness" sounds perfect to me! janet-Thanks. I loved that one too. maggie-I was tickled too. Thanks you so much. lynn-That is so kind of you. I really appreciate it. abby-It's so simple yet sublime. Happy New Year and congratulations. If you're feeling adventuresome, try dousing the sandwich in maple syrup and eating it with a knife and fork. I know it sounds insane, but a friend introduced me to it back in school and once I got past the strangeness of it, I had to admit it was pretty good. Works best with cheddar. How cool! Congratulations to you and look forward to more good writing from you in 2010. That's awesome! And it's so funny it was a recipe that is kind of out there AND a totally classic straightforward recipe! Happy New Year! Wow (though not the least bit surprised, I've always loved your NPR articles - AND your blog posts!)... but none of your commenters have yet mentioned the "surprise" or new thing that you hinted at! I must be the only curious reader... can't wait to hear! And Happy 2010! Congratulazioni! And Happy New Year too! Good job with the video. I like the fast forward!! You are a pro. Oh man, to die for. Wow!!! The crunchy breaded exterior with a bit of red pepper flakes, gooey fresh mozzarella and fresh basil. Dipped in marinara sauce like Susan suggested. A+++++! sues-Yeah, they are kind of opposite, aren't they? anonymous-Wow! You just made my day. Thanks so much! Happy New Year, Susan! And congrats on your NPR recipes!